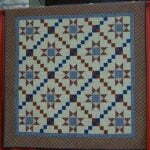 Quilt Raffle to benefit All American Jr Show. All proceeds go to pay for the Romney Breed show costs. This will be the second year that the Romney breed has participated and the first year was a big success. The raffle tickets are $5 each or 5 for $20. Tickets can be purchased by calling (856-866-1747 or 609-760-0399) or email ccshep1@aol.com or c.carlisle@littlehoovesromneys.com . If you are intertested in selling raffle tickets please let me know. The quilt is beautiful, it is a queen size with a red, white & blue star pattern on one side and crazy sheep pattern on the other side. It was made by a friend who donated all of her time & supplies so that we could raise the money for our youth to participate. 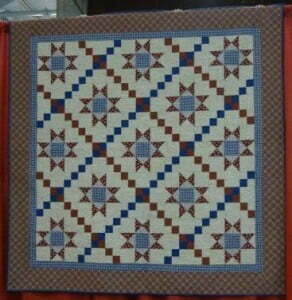 The quilt will be signed and dated and will be one of a kind. Pictures will be available on the ARBA web site, the Romney Ramblings and FaceBook. The All American Jr show will be held in Harrington, DE on July 1-3, 2011. This is only the 2nd time that this show has been on the east coast and we want to make the best of it. Specific details are available on the All American web site: www.allamericanjuniorshow.com . Delaware is going all out to make sure that our kids have a good time, please support the show with active participation or by buying raffle tickets.